Charles Knights is about to have his prostate removed in a rather extraordinary way. "It's a better operation altogether," he said, "totally different from the old way." In an operating theatre at Addenbrookes hospital in Cambridge staff are preparing a pretty scary looking machine. It has metal arms covered in plastic. It looks rather like a giant spider. In fact it is a Da Vinci robot. The latest high-tech tool in the surgeons armoury - and is one of only very few in the NHS. 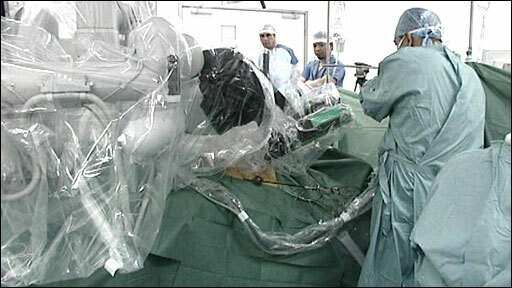 Charles is wheeled in, the robot is put into position, tiny holes are made in the abdomen for the arms to go in and after about an hour the operation begins. The most disconcerting thing is that the machine seems to be working on its own. The arms make tiny movements up and down and there is no surgeon in sight. In fact Professor David Neal is in the corner of the room. It looks like he is playing a computer game. He controls the robot at a terminal some distance from the patient. The robot allows him to operate with extraordinary precision and because the whole process is less invasive than normal surgery its better for the patient. Professor Neal said: "With the old method of open surgery the patient would be in hospital for a week and it could take six months before there was a full recovery. "With this the patient is out in 24 hours and can be back to work in three weeks." In the last 60 years the NHS has seen extraordinary innovations: from the first test tube baby to heart transplants. But innovation isn't all about fancy bits of kit. As the NHS turns 60, BBC News is giving it a health check. Watch out for reports, features and analysis on TV, radio and the web. Sometimes it can be as simple as managing staff better. In the waiting room at the A&E department at Addenbrookes bored faces stare at magazines in silence. Patients should be seen in four hours, but in some hospitals when you get to three hours 59 minutes they admit you to a ward just to meet the target. Not here. Unlike other hospitals the A&E department at Addenbrookes is staffed with consultants and senior doctors. You only get admitted here if you need to be. "What we've gone for is instead of admitting people to make a decision we decide to admit people." said Dr Adrian Boyle, consultant in emergency medicine. "We've found we've dropped the number of people who need to come into hospital by actually doing this." On the other side of the hospital Phil Wing is about to have a dose of radiotherapy to remove the cancer in his throat. 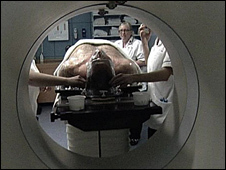 He is being manoeuvred into a Tomotherapy machine - again the only one of its kind in the NHS. It does two very clever things. First, it pinpoints extremely accurately exactly where the radiation needs to go with a CT scanner. And secondly instead of delivering the radiation from one point it fires small amounts of radiation from 51 points in a circle. It means less healthy tissue is damaged. Phil said. 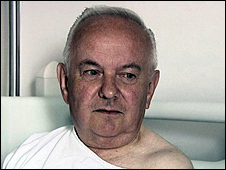 "The treatment I've had here is excellent. "I understand there aren't many bits of kit like this around the country so I'm very lucky and very pleased." But there is a sting in the tail to all these new innovations. The Tomotherapy machine costs £2.2m, the Da Vinci robot £1m. Will the NHS be able to afford these innovations in the future ?